PennsylvAsia: Nom Nom Nippon at CMU, March 1. 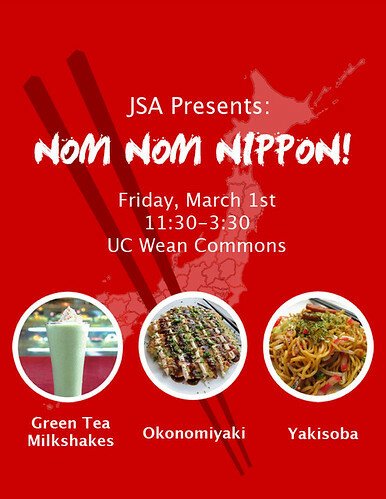 If you're around the Carnegie Mellon campus on Friday afternoon, there will be Japanese food for sale at the University Student Center, courtesy of the Japanese Student Association at CMU. They'll be in the Wean Commons on the first floor from 11:30 to 3:30. More details on the event's Facebook page shortly.